Through its Delivery Group on Digital Enterprise, the Digital Skills Partnership (DSP) is working to increase digital capability among SMEs, in order to build thriving and inclusive local economies. The Partnership, convened by the Department for Digital, Culture, Media and Sport (DCMS), and announced as part of the Government's Digital Strategy, brings together representatives from the public, private and charity sectors to support digital skills provision at all capabilities across the digital skills spectrum. In this guest post, Ronan Harris, MD, Google UK and Ireland, shares how the company is looking to help market traders seize on the opportunities of digital, as part of the next phase of its Digital Garage programme. 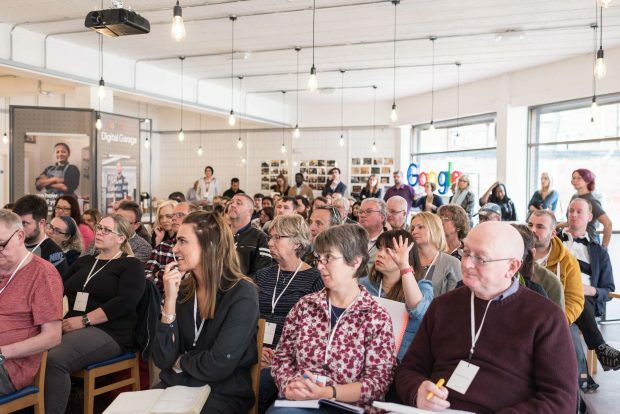 Market traders and local residents attend a Google Digital Garage training event in the market town of Wrexham © Google 2018. Technology has transformed the way we work, live, and play. It’s created vast opportunities for businesses of all shapes and sizes to reach new audiences and grow beyond their local area with the help of an online presence. Small businesses with a strong web presence grow more than twice as quickly as competitors, create more than twice as many jobs, and are 50% more likely to sell outside of their immediate region. However, there are still thousands of businesses who are yet to unlock the potential of digital. That’s why we’ve been delighted to work together with the Digital Skills Partnership to give people, small businesses and entrepreneurs across the UK free training boost their knowledge in all things digital. Over the last year, the Google Digital Garage programme has seen us travel to over 200 towns and cities across the country, from Penzance and Weston-Super-Mare to Scarborough and Blackpool – training over a quarter of a million people in digital skills along the way. As a result, 88% of attendees changed the way they run or promote their business online, with 68% seeing positive results in sales, bookings, web traffic and followers. We are committed to working closely with the Local Digital Skills Partnerships (Local DSPs), and supporting local, bespoke interventions that empower communities across the country. Today we announce the next phase of our Google Digital Garage programme: a tour to upskill local market traders. Local markets are often at the economic and cultural heart of Britain’s towns. However, despite their strong history of entrepreneurialism, local markets are facing significant challenges in today’s economy, as competition from supermarkets, shopping centres, and online stores grows, and digital technologies transform how people live, work, and shop. At the same time, there is a significant new opportunity for market traders to grow with the help of digital. Today, people are increasingly heading online to seek out markets in their local communities. Google searches for ‘market near me’ have skyrocketed by nearly 3000% over the last 5 years,* and the results from a recent Google survey revealed that 35% of consumers would go online to find out information about their local markets. The research also showed that millennials are giving markets a new lease of life: visiting markets more often today than they were five years ago, spending more than double that of those aged 45 and above, and going online more to discover information about their local markets. But a lack of digital skills is holding back the regeneration of some of Britain’s markets. A 2016 report by Innovate UK highlighted that the top priority (42%) for towns was digital skills, followed by improved digital marketing (36%). Over the coming months, we’ll take our Google Digital Garage tours to local markets to upskill owners of small businesses with the digital skills they need to level the playing field against their competition, reach new customers beyond their local area, and grow. We’ll offer bespoke digital skills training in areas such as social media strategy, building a digital marketing plan and how to make your stall more visible online. And we’ll bring our street-view cameras to markets not yet mapped so they can get an online presence that attracts more customers. People like the vibrancy and community spirit offered by markets, but digital technologies have had a huge effect on their buying behaviour. Initiatives like the Google Digital Garage show that digital technologies can also hold the answer, offering tailored advice and support to help stallholders evolve and giving communities greater access to discover a range of choice offered not just by their local market, but by markets across the UK. The Google Digital Garage is about giving small businesses the chance to unlock big opportunities. We’re committed to helping market traders and their communities grow with digital skills training, helping to ensure that markets preserve their place as the heart of Britain’s towns. Visit https://events.withgoogle.com/markets-tour-uk/ for the latest information on Google's UK Markets Tour. * Google Searches for "market near me" in the UK increased by 2977% between April 2013 and April 2018. Brilliant news and hopefully the opportunity will be extended to the South West.